​Soak in your own private hot springs pool! Formerly Marshall's Hot Springs Cottage. Call 1-604-402-4100, or email hotspringscottage@shaw.ca. Be sure to hit the tab button at the top of the page to see what our guests are saying, and view rates, specials, and up-coming events. Ask about our mid-week special. To book the cottage Just call, or email with your name, number of guests, and contact phone number, and we will process your booking, or click on request to book. A perfect year-round vacation spot! 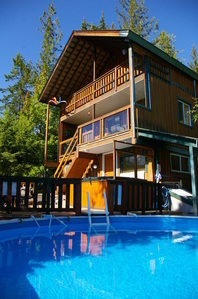 Perched on a rocky bluff above Upper Arrow Lake, the Hot Springs Cottage offers panoramic lake views, and breath-taking vistas of Mount Odin and the surrounding peaks. Enjoy the hot springs water from the renowned Halcyon Hot Springs (with its lithium content) in your own private above ground swimming pool, and hot tub. Enjoy cooking, dining, and relaxing in the open concept kitchen, dining room, and living room. Satellite TV, a DVD player with movie selections, some books and games are available for your entertainment. 2 + 1 bedrooms (see rates), full bath, en suite; sleeps 6 comfortably (up to 8 in total). No pet policy! Located close to Halcyon Hot Springs resort (with public pools, spa, and restaurant), and 34 km to Nakusp with shopping, restaurants and 9 hole golf course. Revelstoke, approximately 1.5 hours away, also offers shopping, restaurants, and is known for excellent skiing, heli skiing and snow mobilling. Surrounding areas provide many hiking and fishing opportunities for the outdoor enthusiast. You may find, though, that you never want to leave the cottage, as it truly provides a year-round relaxing experience all on its own! It has been called a "hidden gem." Families welcome. Not suitable for very young children, but a perfect place to connect as a family. No parties please. Year round weekly special. Book seven days for the price of six! Be sure to hit the tab button at the top of the page to see what our guests are saying and for rates, specials, and up-coming events.